As the price of produce continues to edge upwards and the stresses of everyday life nudge people toward nature, more homeowners are donning gardening gloves, cultivating a sunny, earth-filled spot and conjuring up some homegrown fresh goodness. “You don’t need to have a giant backyard to be successful,” says gardening guru and HGTV’s Home to Win host Carson Arthur. “You can grow fresh food anywhere,” he says. In fact that is the gist of his recently released new book, Vegetables, Chickens & Bees: The Art of Growing Food Anywhere. “The book is really all about the ABC’s of growing food and how people can apply it to their own space,” says Arthur. And for the condo or townhome owner whose outdoor space may be limited, this is great news — raised beds, townhouse rooftops, vertical walls — any outdoor space is fair game. Many of Calgary’s builders and developers are greening up multi-family residential architecture, incorporating gardening components like private plots or raised beds as an amenity draw. Take for example Brio Bridgeland, a boutique luxury 15-unit condominium project on McDougall Road in Calgary’s hip northeast inner-city community of Bridgeland. A roof-top amenity space on the fourth floor will brim with landscaping, benches, and an outdoor kitchen, along with raised beds for owners to get their hands dirty in, growing vegetables and flowers. 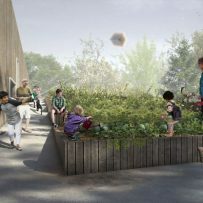 The two-storey loft-style designs will also feature personal built-in raised beds on the upper 400-square-foot terrace. The units also have a main floor terrace of similar size. One bedroom and two-bedroom single level units are also available. “We really wanted to create an ode to the neighbourhood. For the past 80 years, residents here have been gardening. It’s a real tribute to the community,” says Todd Klewchuck, realtor at Royal LePage and sales and marketing lead on Brio Bridgeland. He notes that interest in the project has been strong. “It’s really going to be quite fabulous. The people looking are quite eclectic; they like the inner-city, the outdoors and their gardening,” he says. The folks at Partners Development Group would have to agree. Community gardens have recently become a coveted amenity within its Arrive townhome projects, including its latest at Crestmont West, a collection of 175 villa-style homes with walk-out basements and two- and three-bedroom, multiple storey homes, all with attached garages and environmentally built to Built Green Gold standard. Greg Gutek, the company’s president, spearheaded the gardening box initiative a few years ago, starting with Arrive at Skyview Ranch Arbours. “I’m a gardener, so it’s a passion project for me. It’s something that was a big part of my childhood and I continue to practice today. So I wanted to share this part of my lifestyle and make sure homeowners have the opportunity to participate,” says Gutek. Max Lalonde, area sales manager for Arrive at Crestmont West, says the concept has been a big hit with buyers. “It’s not an amenity that people expect to see, but they are really enjoying it. People can get their gardening fix, growing flowers and vegetables and the like,” he says. And with a large selection of self-watering containers on the market, you can literally plant and go — for weeks. They are perfect for a lock-and-leave lifestyle. Just remember that soil (make sure it is organic and well-composted) and sun (lots of it) are the two key ingredients. And when it comes to plants, Arthur likens it to the musical West Side Story. “I like to think of companion planting like two rival gangs in your garden,” he says. He likens the tomato group, which includes any variety of tomato, peppers, basil and onions to the Sharks and the second group — beans and brassicas (cauliflower, broccoli, kale and cabbage) to the Jets. “Each group plays well together, but never plant any of the plants from rival gangs together,” he says. And down the middle are the neutrals — lettuces, and spinach. “They play well with everyone,” he says.